1964 Roosevelt “Hot Lips” Dime Doubled Die or Die Clash? 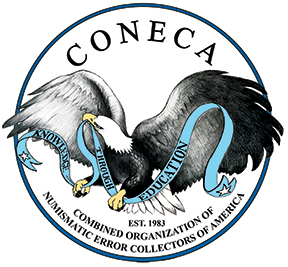 It has been proposed by CONECA’s 20th/21st Century Attributer of US Die Varieties, James Wiles that the coin listed by him earlier as a doubled die is actually the result of clashed dies. Ken Potter, John Wexler and many others disagree. Potter’s analysis is presented below. The problem with the die clash theory is that any design elements from the reverse that could have caused it are so far removed from the areas where clash normally occurs that it’s impossible for it to repeat over and over again as suggested by Dr. Wiles even if rotated dies were involved. The olive leaf clash in front of the lips is well above the lips and thrust outward in a position nowhere near that of any of the “hot lips” varieties, which Dr. Wiles in an email to me suggested was part of the cause of the doubling. In regard to the 1953-S and 1955-S, Dr. Wiles said: ” It was discovered that all had die clash marks and when overlays were made, the reverse design matched the doubled areas. But in truth one only has to look at the overlays I’ve created to see that just isn’t true. Dr. Wiles says the doubled areas are all “too similar” to be the result of hubbing mishaps, however, we have a hub doubled earlobe variety listed for just about every State quarter and beyond. All of any prominence are remarkably similar. 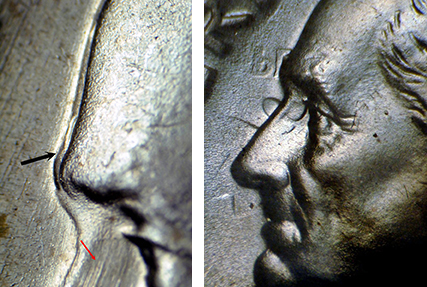 All clash marks I’ve seen on Roosevelt dimes that show in the fields of the obverse are incuse and the doubled lips are raised and rounded without a single indication of abrasion (which Wiles throws into the mix) just like a doubled die. Die abrasion of the era that can sometimes be found around designs is never exacting. It appears like the dark patch of abraded filed below Roosevelt’s throat were it extends to meet the normal field. 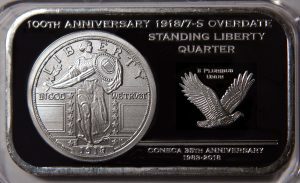 I and John Wexler, (who first examined the 1964-D and listed it), and many other prominent numismatists, originally felt this coin (and others like it) is the result of hub doubling. Still, it must be noted that attributing die varieties is not an exact science and there has been and there will continue to be varying opinions on certain die varieties. 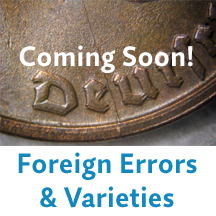 Remember, the 1869/8 Indian Head cent, the 1958/7-P&D Lincoln cents, the 1980-D&S cent, the 1950-S/D dime, and many others have all been debunked by respected attributers, which often included folks who made the original attributions. Also, remember, that the opinion of one is not necessary the opinion of all in a group such as CONECA. It represents one person and one person only who in this particular case is in the minority. It would be nice if Dr. Wiles could provide the overlays he created to demonstrate that this doubling is the result of die clash or abrasion. 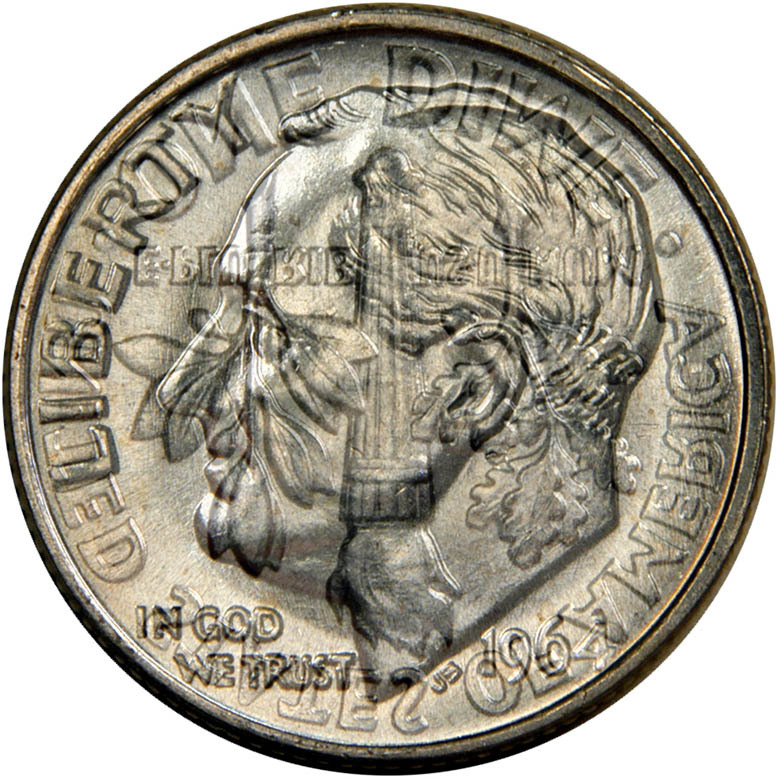 Notice that the areas of strongest doubling, the lower lip and below through the upper chin, and the forehead above the eye socket, aren’t even remotely close to any design from the opposing side of the coin. Left: 1964-D “Hot Lips” Doubled Die dime. Red arrow points to an area where clash often remains after dies have been abraded. It is not there. 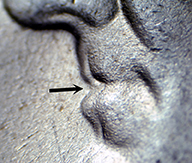 Right: A 1965 SMS Roosevelt dime with a strong die clash.